The community of Sunalta was developed by the Canadian Pacific Railway on a Dominion land grant. It was laid out in a classic gridiron plan and the 25 foot lots were sold from 1909 to 1911 starting at $250 each. The name "Sunalta" won a school contest as the contraction of Sunny Alberta. This was just as Calgary's first major real estate boom was well underway. Sunalta was almost completely built out before 1914 and sales were so brisk that the CPR decided to move ahead with the Sunalta extension in 1912 with a design based on the English Garden City movement. Land prices were peaking and people lined up all night to buy the lots on curving streets. The average selling price for these larger lots was $1100. A good two story home could then be built for around $4000. This Sunalta extension came to be known as Scarboro. Calgary's real estate boom collapsed just after Scarboro was sold out and only 20 houses were built by 1918, mostly on Scarboro Avenue. Sunalta School gave the area a big boost when it was built on the western edge of the city in 1912. A number of lots went back to the city because of unpaid taxes in the 1930s and it would be nearly 40 years before the area was entirely built out. 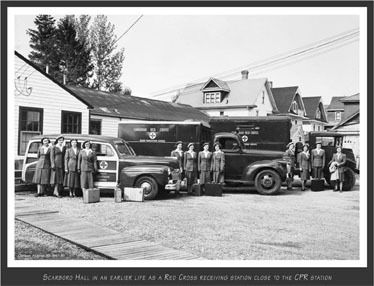 Scarboro is generally credited as being the first community association in Calgary. It was first formed in the mid 1920s and then incorporated in 1934 as a Society. 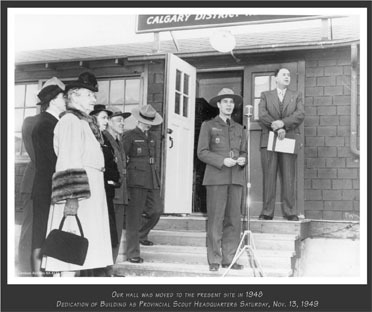 Our first community hall was under the present Crowchild Trail where we had tennis courts and skating rinks in an old sandstone quarry. Both Sunalta and Scarboro are small, old communities in relation to burgeoning Calgary. The two community associations have worked together to maintain the overall area as an attractive residential area for families and others. Our story is about people who have believed in our communities and whose work has made them continue as attractive places to live. There will be something great happening soon!